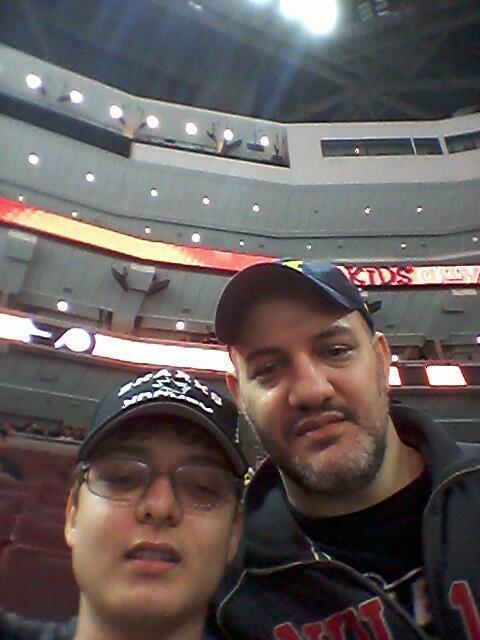 Ryan took a selfie of us at the Sharks-Flyers game. That was a big deal, and did not make me sad. I was a little sad and angry and hurt Monday morning. All the feel-good moments, and there have been lots of them of late, don’t temper those feelings when anxiety arrives and denies my son a good night’s sleep, the simple and richly deserved reward for another day spent following his routines, pursuing his goals, trying to be the best person/student/athlete he can be and working so hard to fit in a world that does not always align with his way of thinking. I want to yell in frustration when sleep eludes him, when he emerges from his room time after time in increasingly agitated fashion, worrying (like we all do) about the number of hours remaining in the night. Only Ryan can’t just shrug and think about sucking it up for one day. He starts recounting the exact number of hours of sleep he’s had for each of the last six days. Sleep eventually came, and I found him at the breakfast table in the morning as I usually do — studying. He had two quizzes that day that were partially responsible for his anxiety. He worries that if he doesn’t get enough sleep, he won’t be able to focus and he won’t do well. I did my best to reassure him and we did what we always do — go about our business of restarting the weekly routines in the hopes that things will go more smoothly the next evening (I’m happy to report it was better. Far from perfect, but better). I tell myself this is but a bump a road filled with many high points in recent months. Not even 48 hours earlier we enjoyed a wonderful day trip to Philadelphia, where we saw the Sharks defeat the Flyers in a shootout to keep their flickering playoff hopes alive. Afterwards, we waited underneath for the players to emerge from the locker room. Ryan saw some of his favorites. Joe Pavelski came over to shake hands. The team PR person who arranged for our postgame access stopped by to say hello and thank Ryan for bringing the team some luck. Each of these experiences only strengthens what I know will be a life-long bond between Ryan and this team. It was a wonderful day, notable for the complete absence of difficulty. Ryan, wary of being an obnoxious visiting fan in Philadelphia, celebrated with restraint. He controlled his nerves when things weren’t looking good for San Jose. He was just thrilled to have another chance to see the Sharks play live this year. As he and I like to say, it’s never a bad day when you get to see your favorite team play live. And it was not lost on me that when we entered the arena, Ryan proudly displaying his new Stadium Series jersey despite being in enemy territory, there was a DJ playing music on the concourse. The song greeted us? The Best of You by the Foo Fighters. You can’t make this up. That song has been on my mind a lot lately, ever since Ryan’s recent championship game. Thinking again about the lyrics as I composed this piece, I once again found Dave Grohl’s words applicable to our situation. That verse speaks to me of the tests that life offers, and how we all respond to them. Life is full of ups and downs, highs and lows, triumphs and challenges, often in close proximity.